There are no duds in the Rolf Binder range of wines, writes Curtis Marsh, who tracks the rise and rise of the South Australian business. Having recently unearthed some possessions from storage in Australia, not sighted for some eight years, I am rather pleased to be reacquainted with my comprehensive collection of old wine books. When I say old, they are not antiquities, but largely from the 60s, 70s and 80s, an era of prolific wine-book authoring and publication. Such scribes are now on the endangered species list with the onset of the Internet, our thirst for immediate answers diminishing the pleasures of leisurely edification, as well as most publishers bowing to commercial mediocrity. It was serendipitous that the first book to engage me was Brice Rankine’s Wines and Wineries Barossa Valley, published in 1971, as I had just the other day meditated over a hedonistic bottle of 2004 Rolf Binder (Veritas) Bull’s Blood Shiraz Mataro Pressings. I had also been recently immersed in Torbreck wines at a dinner convened by owner-winemaker David Powell, one of the Barossa Valley’s leading producers and more colourful personalities. I absorbed myself in Rankine’s comprehensive work, fascinating in its detail of the Barossa’s cultural mix of English colonists and German immigrants, indomitable pioneers of far-reaching significance to Australia’s Heritage. Parts of his preface intrigued me: “The Barossa has come a long way in the last hundred-odd years,” referring to the radical change to producing red and white table wines, when the region had for so long been a slave to a fashion for fortified wines and brandy spirit. Interestingly, much of this change in taste is attributed to the next generation of European immigrants, particularly Italian and Greek, arriving after World War II along with Australian returned servicemen, evidently indoctrinated in the pleasures of wine. No one could contemplate the phenomenal extremes of fortune the Barossa Valley would endure these past two decades – from the rock bottom of market-saturated oblivion and subsequent vine-pull scheme in the mid- 1980s to a meteoric rise in global recognition, particularly in the US, where the robust, full-flavored Barossa reds have an apostolic following. It is amusing that Rankine is apologetic for not incorporating every wine produced in the region, which had more than 20 wineries and most of them big companies. If he thought the task daunting then, I suspect he would judge it insurmountable today, with 120 wine businesses based in the Barossa. Moreover, one can only guesstimate the number of labels made outside of the region. The biggest change in the status quo is the progressive rise of the grape grower, who for generations had exclusively supplied the larger wine companies. Predictably they are capitalizing on the burgeoning demand as well as seeking recognition of their own, choosing to either make their own wines, some in joint ventures with established winemakers, or have them contract made. There is also a multitude of opportunists, sourcing fruit from growers and striking labels at an alarming rate. Thus, the picture is becoming a complex mosaic; little wonder nobody, to my knowledge, has taken on the task for a comprehensive contemporary account of the Barossa Valley. It is also impossible to ignore the substantive contribution influential wine critic Robert Parker has made to Barossa’s popularity in the wine-drinking world, particularly in the United States. It is ironic that, initially, Parker refused to review any Australian wines or even consider visiting the wine regions, declaring that there were insufficient wines of merit to justify it. I am unsure of exactly when or which wine/s caused Parker’s change of heart, however, it is clear that the Barossa Valley struck a chord. More specifically he rated the 1996 Veritas The Malcolm Shiraz 99 out of 100, at the time the highest ever pointed Australian wine. Evidence that this was not just aberration, Parker rated the 1998 Veritas Hanisch Shiraz 99 points out of 100. Veritas was already achieving local accolades with back-to-back trophies in 1995 and 96 for the Best Shiraz at the Barossa Wine Show, proceeding on to a hat trick with the trophy for the Best Small Producer 1996, 97 and 2002. 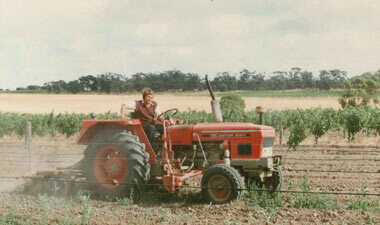 Rolf on a tractor on the Chri-Ro Estate (next to the winery)discing the weeds. Photo from the early 1980's. Should you ever meet Rolf Binder , do not be fooled by his lackadaisical facade, it is his attempt to humbly obscure a dynamic and entrepreneurial winemaker who pioneered a renaissance of old vine shiraz, mataro (mourvedre) and grenache blends through the 1980s. While his focus is Rolf Binder wines, Binder is altruistic, as seen in his many joint ventures. These include a partnership with Noel Young, one of the most reputable independent wine merchants in England, with their facetiously British Magpie Estate label www.nywines.co.uk. He is also partner and winemaker for JJ Hahn, producing genuine old-vines shiraz from the original Hahn family vineyards that they have worked over several generations since 1846. Then there is the joint venture with the equally jovial David Mitchel from Kilikanoon in the Clare Valley www.kilikanoon.com.au called Binder Mitchell. Needless to say, a morning of barrel tasting with Binder takes on heroic proportions. If you manage to survive it, you are treated to his mother’s Hungarian spicy bean soup called Bab Leves (pronounced bab le-vesh) that instantly revives the most fatigued palate, although has rather menacing flatus side effects. While too magnanimous to tarry over less successful ventures, I shall take it upon myself to emphasize he is no longer the winemaker for the Two Hands label, which continues to live off his reputation. 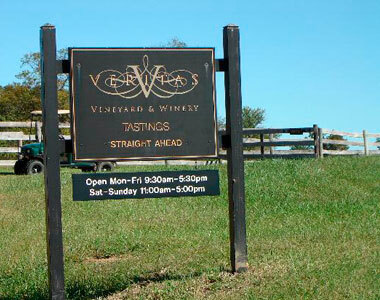 There were also sour grapes with a Johnnie-come-lately winery in Virginia, US, which trademarked the Veritas name in 2002. Although the Binder family had established Veritas 50 years ago, these litigious persons wanted to lock horns. Encouraged by his US distributor, Binder opted to change both name and label design, acquiescing that the Veritas image was a bit old fashioned and staid. But, as it turns out, Veritas has its own trademark covering Australia, and the Bull’s Blood label will remain unchanged for the domestic and Asia markets – apparently by popular demand. A marketing survey result gave unanimous feedback that this old label should not change. Thus it is the only wine in the entire range to remain as such. The wine is labeled Hubis for other export markets. Despite the different brands and broad range of wines that Rolf Binder makes, I can assure you, there are no duds; whether it be his most affordable offerings such as the Christa Rolf Shiraz Grenache, a Cotes du Rhone-style red on steroids, or the blockbuster flagship Hanisch Shiraz, eked from just 11 rows of old vines. My personal favorite is the Bull’s Blood, first made by Rolf Binder Snr in 1967 and then called Bikaver, after the traditional Hungarian Egri Bikaver. The current 2004 vintage is about as cuddly as red wine gets and is the quintessence and ethos of the Barossa Valley, exhibiting a port-like concentration of blood plums, dried figs and Christmas cake fruits among a lingering perfume of rose petals and burnt timbers. It is intensely sweet on entry, spicy with cinnamon and clove, charcoal toasty vanillin oak with gripping, powdery tannins from start to finish (characteristic of using the pressings). There is layer upon layer of creamy richness, dark chocolate coated berry fruits, turning more briary, with the distinctly gamey-animal pelt and dried herbal nuances of 100-year-old mourvedre vines becoming more evident, and tailing off with a grind of black peppermill and excellent acidity; an iron fist in a velvet glove. For more information, visit www.veritaswinery.com. A range of Rolf Binder wines are available through Altaya wines Hong Kong, Tel: +852 2523 1945, www.altayawines.com.